How much time do you spend eating breakfast each day? Maybe 10 or 15 minutes, if you're like most people. We're usually in a hurry to get to work or school, and we don't want to make much of a fuss over breakfast. 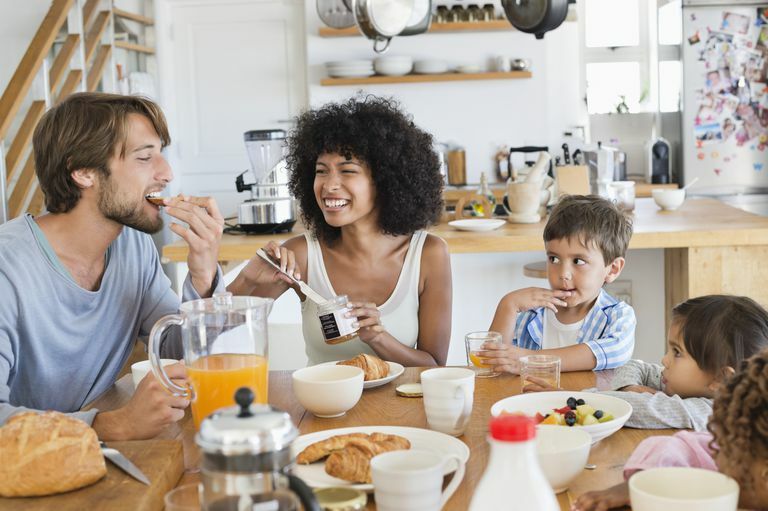 Some people skip breakfast (not a good idea), and others eat breakfast in the car, but most people eat breakfast at home. You want a breakfast that's easy and quick to prepare - the less cooking, the better - so you can get out the door fast. You need to eat breakfast foods that are good for you, so here are a few easy and healthy breakfast ideas to get you going every morning. Pouring some dry breakfast cereal into a bowl and adding some milk is about as easy as breakfast gets. Most breakfast cereals are fortified with vitamins and minerals, but many of them contain large amounts of sugar. Choose cereals that are high in fiber with less added sugars. Aim for less than five grams of sugar per serving. One serving is about 3/4 of a cup, along with 1/2 cup of milk (preferably low- or non-fat milk). If that's not enough to fill you up, you can round out your breakfast with a slice or two of whole-grain toast with peanut butter and a small glass of 100-percent fruit or vegetable juice. The toast and peanut butter will add some fiber, healthy monounsaturated fat, and protein that will keep you feeling full through the morning. The juice adds vitamins, minerals, and phytochemicals. Your blender might become your favorite breakfast kitchen appliance if you like thick and flavorful fruit smoothies with fresh and frozen fruits plus milk, water or juice. Follow these smoothie tips to make a basic fruit smoothie, and then experiment with any type of fruit that you'd like. If you want a little extra sweetness, you can add a little honey, a sprinkling of sugar (not too much, though), or a packet of artificial sweetener. Boost the nutritional power of your smoothie by adding a bit of flax oil or milled flax seeds and some plain yogurt or peanut butter. The healthy fats and proteins combined with the fiber in the fruit will help keep you feeling full longer. Avoid commercial fruit smoothie mixes that are mostly sugar and artificial flavorings, and resist the temptation to add a couple of scoops of ice cream, which will turn your healthy breakfast smoothie into a high-calorie splurge. These are easy to make from scratch and only take a few minutes. Scramble or fry an egg and serve it on 100-percent whole grain toast for a basic sandwich. Add interest and flavor (and calcium) with a slice of cheese, or add mushrooms, peppers, and onions to your scrambled egg. Chop the ingredients the night before and keep them in the refrigerator to save time. If you don't like eggs, make a grown-up peanut butter and jelly sandwich with nut butter, 100-percent fruit spread, and whole grain bread. Or for something different, try a peanut butter and fruit wrap. There's really no official rule that requires you to eat only foods with eggs, sugar, or cereal for breakfast. A lean turkey sandwich with sprouts and mustard on whole grain bread is a good choice any time of day. Whatever type of sandwich you choose, be sure to use whole grain bread, bagels, wraps, or English muffins for extra fiber. You can also buy ready-made breakfast sandwiches in the freezer section of your grocery store for a quick heat-and-eat breakfast. Some are better for you than others; read the labels to find the sandwiches that are lowest in fat, sodium, and calories. If you're not a fan of oatmeal, you can eat hot wheat cereal or try quinoa, a delicious and healthy seed that can be served like oatmeal. Whatever hot cereal you choose, boost the nutrition by adding blueberries, strawberries, or cut fruits, along with some chopped nuts like pecans, walnuts or almonds. Serve with milk or 100-percent fruit juice. So many foods are associated with breakfast, like sweet cereals, eggs, bacon, pancakes, waffles and French toast with gobs of maple syrup. But there's nothing wrong with eating non-breakfast foods instead, like the leftovers you have from dinner the night before. As with any healthy breakfast, be sure to include protein and plenty of fiber to help keep you full until lunch. Heat up a piece of leftover chicken with lots of green beans or other vegetables on the side. Add a slice of whole grain bread and serve with a healthy beverage like water, low-fat milk or 100-percent juice. Have some simple foods ready for those super-busy mornings when you think you don't have time for breakfast. Grab a couple of your favorites and breakfast is ready in less than one minute.